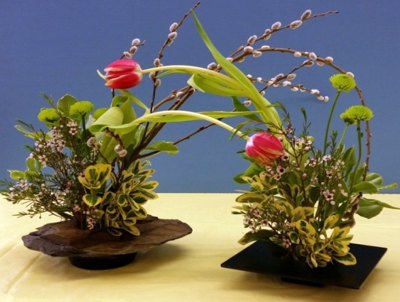 Ikebana is Japanese Flower Arranging. The first school was Ikenobo where Buddhist monks and later samurai warriors used it as a form of meditation bringing nature indoors and enhancing the natural world. Today, there are over 2000 schools. Sogetsu school, which Victoria teaches and practices, was created in 1926 by Sofu Tashikahara and is one of the modern schools of thought. The schools philosophy comes from the belief that arrangements could and should be made from whatever materials available around the world. 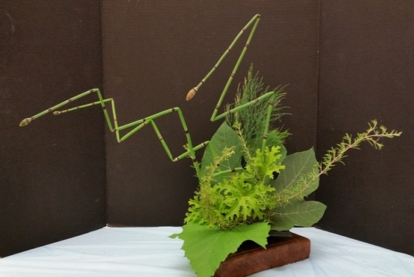 Sogetsu ikebana is learned by doing the lesions in 5 different books, observing other students and teachers and attending flower shows and workshops. One does not become an expert overnight but by steady practice, observation and patience. 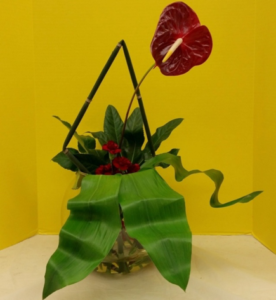 Arrangements are mostly created either by using a Suiban (shallow dish) or Nageire (upright container or vase). Advanced students learn to use all kinds of different containers including creating one’s own container. Only fresh or dried flowers and leaves are used. Victoria has been studying ikebana for over 12 years before starting her work on getting her teacher’s certificate. She was awarded her 4th teachers certificate in December 2017. Victoria has a passion for patterns and color which reflect in her work.